Ålesund ([²ɔːləsʉn]) is a town and municipality in Møre og Romsdal county, Norway. It is part of the traditional district of Sunnmøre, and the center of the Ålesund Region. It is a sea port, and is noted for its unique concentration of Art Nouveau architecture. The town of Ålesund is the administrative centre of Ålesund Municipality, as well as the principal shipping town of the Sunnmøre district. Ålesund Municipality has a population of 45,033 as of 2013, while the greater Ålesund urban area has a population of 48,460 (this also includes most of neighbouring Sula Municipality as well). The port of Ålesund was established as a municipality on 1 January 1838 (see formannskapsdistrikt). It was completely surrounded by Borgund Municipality. The port of Ålesund received town rights in 1848. On 1 January 1875, part of Borgund Municipality (population: 902) was transferred to the town of Ålesund. In 1922, another part of Borgund Municipality (population: 1,148) was transferred to the town of Ålesund. On 1 January 1968, most of the neighbouring municipality of Borgund (population: 20,132) was merged into Ålesund. 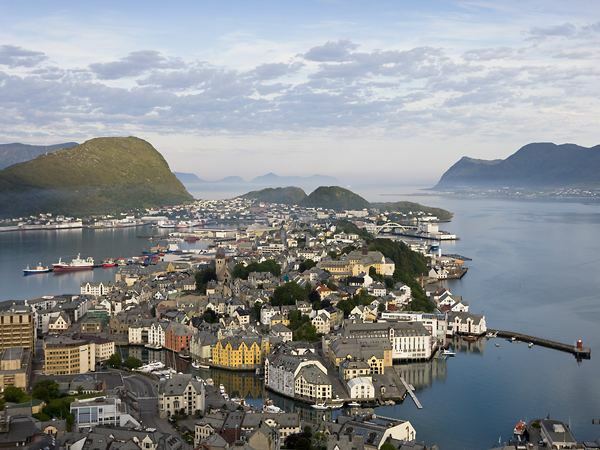 This merger more than doubled the population of Ålesund, for a new total population of 38,589. On 1 January 1977, the island of Sula and some small surrounding islets (population: 6,302) were separated from Ålesund to form the new Sula Municipality. A part of the town was originally known as Kaupangen Borgund. The Old Norse word kaupang means "marketplace" or "town", thus the market town for Borgund. The Old Norse form of the current name was Álasund. The first element of that (probably) is the plural genitive case of áll which means "eel" and the last element is sund which means "strait" or "sound". Before 1921, the name was written Aalesund. The coat-of-arms was granted on 1 April 1898. The arms symbolize the importance of fishing for the town. The type of ship was typical for the ships used in the 18th and 19th century and is taken from a drawing made in 1762. The waves and fish were added to the drawing in the arms. The arms are shown in the Kaffe Hag album with the boat sailing right instead of sailing left. The Church of Norway has five parishes (sokn) within the municipality of Ålesund. It is part of the Nordre Sunnmøre deanery in the Diocese of Møre. The seat of the deanery is at Ålesund Church. Legend has it that Gangerolf (outside of Norway better known as Rollo), the 10th century founder of the dynasty of the dukes of Normandy, hailed from the community of Giske, north-west of Ålesund. At least three statues of Rolle exist: in the town park in Ålesund, in the city of Rouen, France, and in Fargo, North Dakota, United States. In 1835, Ålesund had 482 inhabitants. By 1900, the population had increased to 11,777. In the night of 23 January 1904, the town was the scene of the Ålesund Fire, one of the most terrible of the many conflagrations to which Norwegian towns, once built largely of wood, have been subjected. Practically the entire town was destroyed during the night, a gale aiding the flames, and the population had to leave the town in the middle of the night with only a few minutes' notice. Only one person died in the fire, the 76-year-old Ane Heen, but more than 10,000 people were left without shelter. 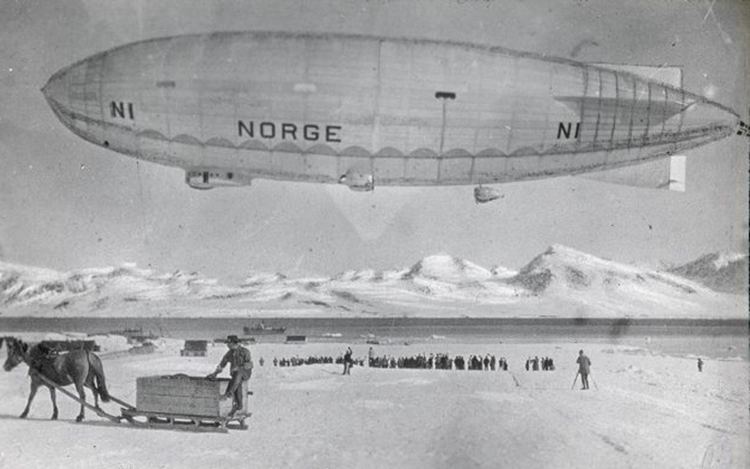 Kaiser Wilhelm of Germany had often been on vacation to Sunnmøre. After the fire, he sent four warships with materials to build temporary shelters and barracks. After a period of planning, the town was rebuilt in stone, brick, and mortar in Jugendstil (Art Nouveau), the architectural style of the time. The structures were designed by approximately 20 master builders and 30 Norwegian architects, most of them educated in Trondheim and Charlottenburg, Berlin, drawing inspiration from all over Europe. 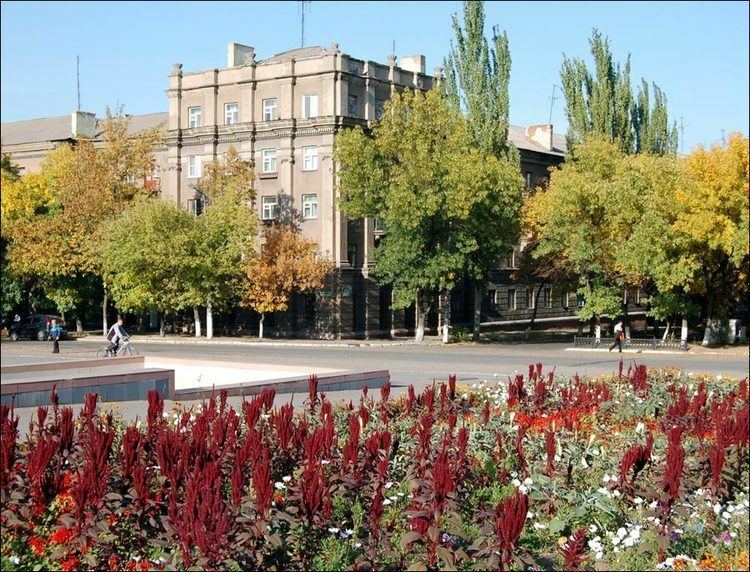 To honor Wilhelm, one of the most frequented streets of the town is named after him. The town has an unusually consistent architecture, most of the buildings having been built between 1904 and 1907. Jugendstilsenteret is a national interpretation centre, visitors can learn more about the town fire, the rebuilding of the town and the Art Nouveau style. 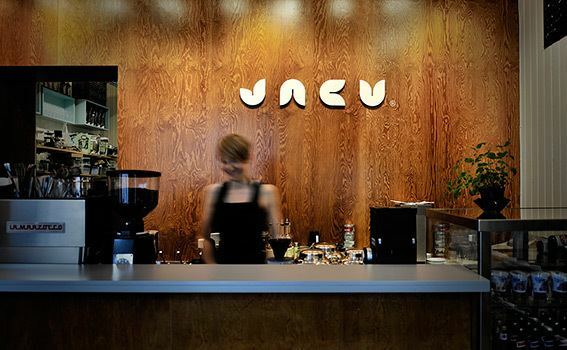 Ålesund is a partner in the Art nouveau network, a European network of co-operation created in 1999 for the study, safeguards and development of the Art nouveau. The term "Little London" was often applied to the community during the occupation of Norway by Nazi Germany due to the Norwegian resistance work that took place here. 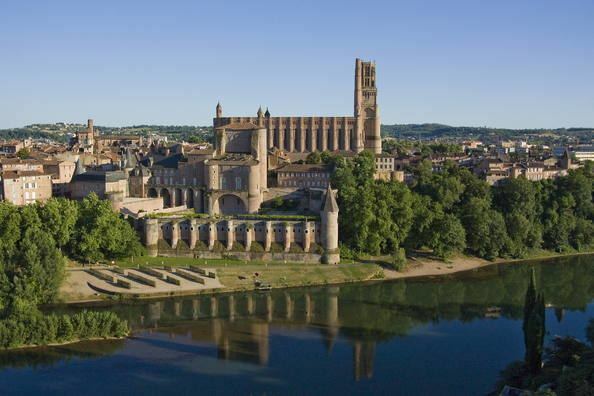 Among other things, the city was central to the flights to Scotland and England. The municipality of Ålesund occupies seven of the outer islands in the county of Møre og Romsdal: Hessa, Aspøya, Nørvøya, Oksenøya, Ellingsøya, Humla, and Tørla. The town centre is located on the islands Aspøya and Nørvøya, while Heissa and Oksnøya contain residential areas. The second largest island, Ellingsøya, used to be accessible only by boat or by road via Skodje Municipality, but the undersea Ellingsøy Tunnel was built in 1987 to make traveling between the island and the town centre more convenient. The tunnel is 3,481 metres (11,421 ft) long, and was upgraded in 2009. The municipality covers an area of 93 square kilometres (36 sq mi). The population (2013) is 45,033, making the population density of 482.5 inhabitants per square kilometre (1,250/sq mi). The population of the agglomeration, which includes parts of the neighbouring Sula Municipality, is 48,460. The municipality also contains three smaller separate urban areas on the island of Ellingsøya: Hoffland, Årset, and Myklebost with a total population of 1,279. Other villages include Løvika and Spjelkavik, both on Uksenøya. Ålesund has the most important fishing harbour in Norway. The town's fishing fleet is one of the most modern in Europe. Ålesund and surroundings also has a large furniture industry. Some well-known household items are manufactured here. In the 1950s and 1960s, Ålesund was one of the chief stations of the herring fishery business. In relation to the relatively large fishing fleet belonging to Ålesund and nearby harbours a large shipbuilding and ship equipment industry has evolved. There are not any yards building ships in Ålesund any more, the last shipyard - Liaaen Shipyard evolved into ship repairs and since late 1990s has mainly been serving the offshore industry through the company Liaaen Technology that merged and rebranded to Strata Møre in 2007. In the close by communities however shipyards continue to operate successfully: Vard, Ulstein Verft, Kleven Maritime, Havyard Group. When oil was found in the North Sea in the 1970s the local fishing fleet ship owners seized the opportunity and rebuilt fishing vessels to serve the infant oil exploration and production industry. Soon they were able to build purpose designed offshore vessels at local shipyards to serve the North Sea oil adventure even better. Today this has become a cornerstone industry in and around Ålesund through leading offshore supply ship owning companies Farstad, Bourbon, Olympic, Havila, and Rem. Serving the ship building industry a large number of equipment manufacturers has evolved: Rolls Royce, Odim, Sperre, Optimar, Ship Equip, Jets and many more. To the east of Ålesund lies the Sykkylven Municipality where the Ekornes factory, producing furniture such as the StressLess chair, is located. Håhjem, another village near Ålesund, contains the headquarters of the Stokke company. Ålesund is also one of the harbours at which the Hurtigruten arrives two times per day. 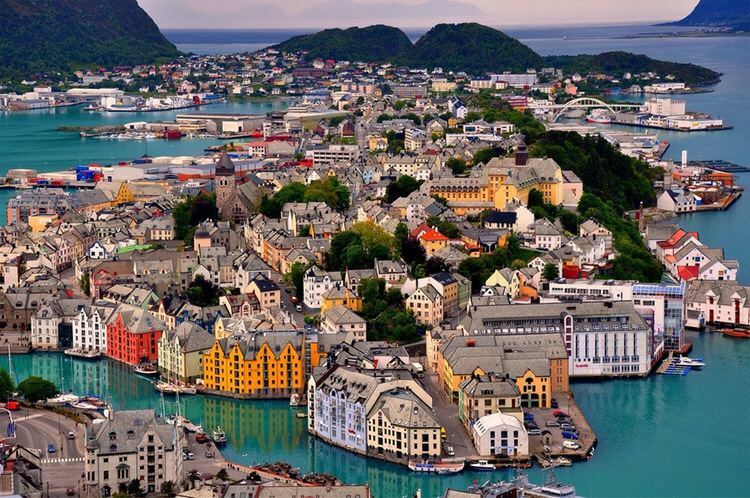 Ålesund is a popular tourist attraction, both due to its picturesque town center and its proximity to major fjords. The Atlanterhavsparken aquarium is another tourist attraction. From Øye at the head of Hjørundfjorden, a road strikes south to the Nordfjorden, and from Maråk on Geirangerfjorden another strikes inland to Otta. The Rauma Line starts at Åndalsnes, 120 kilometres (75 mi) east of Ålesund, going to Dombås, then southwards on the Dovre Line to Lillehammer and Oslo. 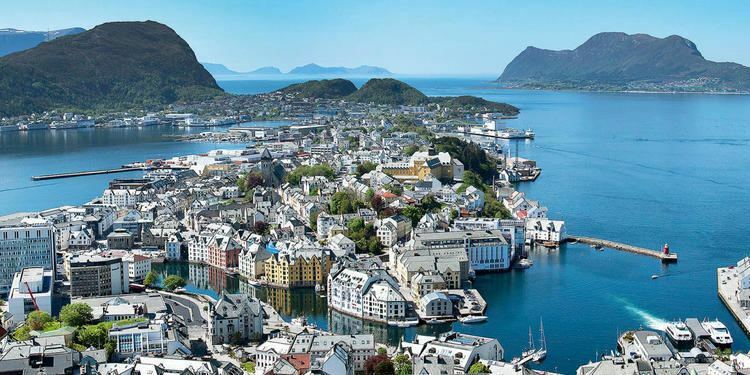 Ålesund is a port of call for passenger and freight vessels travelling between Bergen, Kingston upon Hull, Newcastle, Hamburg, and Trondheim, including the Hurtigruta (Norwegian Coastal Express) cruise ships, which arrive in Ålesund twice a day. The town's airport, Ålesund Airport, Vigra, has several daily flights to/from Oslo, Bergen, Trondheim, and Copenhagen. It also has several weekly flights to/from Riga (Riga International Airport) (AirBaltic) and London (London Gatwick Airport). In November 2012 KLM announced it would fly to Ålesund 5 days a week from Amsterdam starting in April 2013. Lately, there have been suggestions of a high-speed rail link to Oslo as well as metro-style local services to meet the needs of the expanding population of the town. The Norwegian Centre of Art Nouveau Architecture, Jugendstilsenteret, is situated in Ålesund. It is a museum and competence center with exhibitions telling the story of the town fire and Art Nouveu/Jugendstil in Norway and Europe. The local newspaper is Sunnmørsposten, founded in 1882 and published six days a week. 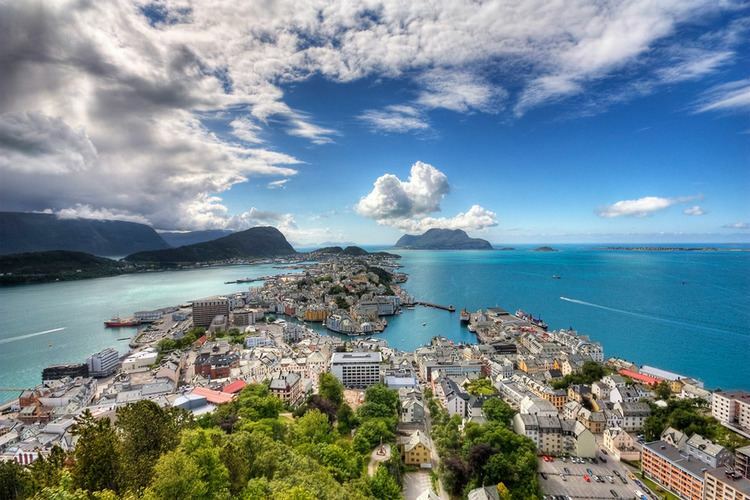 Ålesund is the site of the annual Norwegian Food Festival. Ålesund has a university college, Ålesund University College (Norwegian: Høgskolen i Ålesund, with approximately 1,800 students and 150 employees. The Ålesund School of Art (Norwegian: Ålesund Kunstskole) is a school for visual arts located in Ålesund. The Norwegian School of Management had a campus in Ålesund, but it closed on 1 August 2008. Ålesund videregående skole, also known as Latinskolen, formerly Aalesund Lærd- og Realskole, is the oldest secondary school in Ålesund, having been established in 1863. Of the six upper secondary schools in Ålesund, including Latinskolen, Fagerlia videregående skole is the largest with room for approximately 1,000 students. A new International school will be opened for children aged 5–15 in Ålesund in 2012. The local football team, Aalesunds Fotballklubb ("Aalesund's Football Club"), (AaFK), was founded in 1914. The team played in the Norwegian premier league for the first time in the 2003 season. The club won its first Norwegian FA cup in 2009 and won again in 2011. They played their home matches at Kråmyra Stadium until the 2005 season, when they relocated to the new Color Line Stadium, located approximately 1 kilometre (0.62 mi) outside the town centre. AaFK's supporter club is called "Stormen" and has about 2,000 members. Mark Kozelek wrote and performed an eponymous song about Ålesund under the Sun Kil Moon moniker, on the record Admiral Fell Promises.